The Nexus is a connection between complex, existing and developing communities in mutual tolerance despite different ideologies and interests. 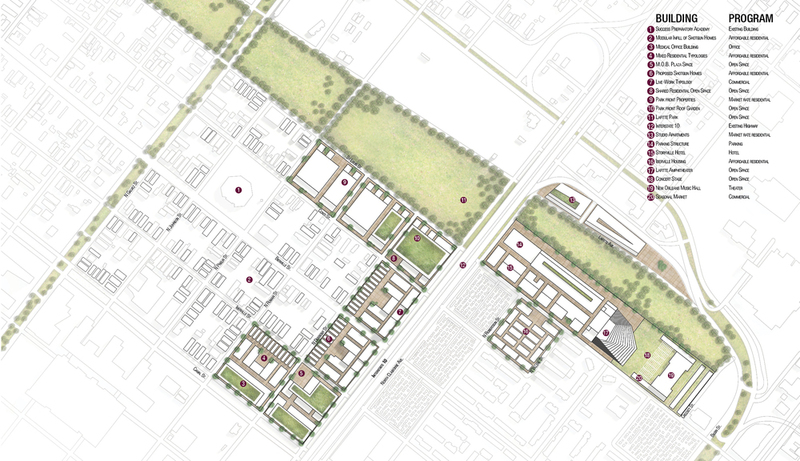 By creating a set of rules and strategies for future infill, The Nexus weaves resiliency and flexibility into New Orleans as it faces an uncertain future. The site is situated in the Treme neighborhood amongst external pressures: the historic French Quarter, Lafitte Greenway, LSU Medical Center, VA Medical Center, and the Iberville Housing Project. The Nexus bridges these various districts of New Orleans to encourage an environment of co-existence, creating and establishing exciting opportunities for years to come. To make this area an example of resilience, we address the challenges of water and its coexistence with the site, attending to the broader dynamics of urbanization and inequality. The Nexus addresses equity, social justice, inclusive communities, environmental health and well-being through acupuncture strategies of infill and development. To reduce the community’s vulnerability, we strive to create a connected and strong community network through multiple intelligences. The Nexus represents a focal point for many of the existing and future pressures of New Orleans, thus the necessity for a seamless coexistence through design.